Queen Elizabeth National Park in Uganda is located within the western rift valley floor and was gazetted in 1952 as Kazinga National Park attaining its nomenclature from the 45m long Kazinga channel that bisects the park adjoining Lake George and Lake Edward. Queen Elizabeth National Park overlooks the highest point in Uganda Rwenzori Mountains with their snowcapped peaks as they were described by Ptolemy in 150AD as the mountains of the moon. 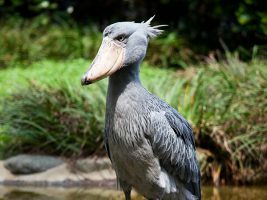 It extends over a geographical coverage of 1,978km2 and within its geographical expanse, there thrives 95 mammal’s species, 600 species of birds which makes it the number one in terms of bird count in Uganda and the second in Africa and the sixth in the world, 10 species of primate and 20 predator species. Queen Elizabeth National Park is re-known for its tree climbing lions that dwell in the Savannah landscapes of Ishasha dotted with short fig trees where lions rest during most of their day time. These unique trees climbing lion species thrive only in Queen Elizabeth National park and Lake Manyara National park in southern Tanzania. Besides that, the park has the famous Kyambura gorge which is 1km wide and 100m deep containing populations of Chimpanzees thriving in lush tropical forest that is amazingly flourishing below sea level. 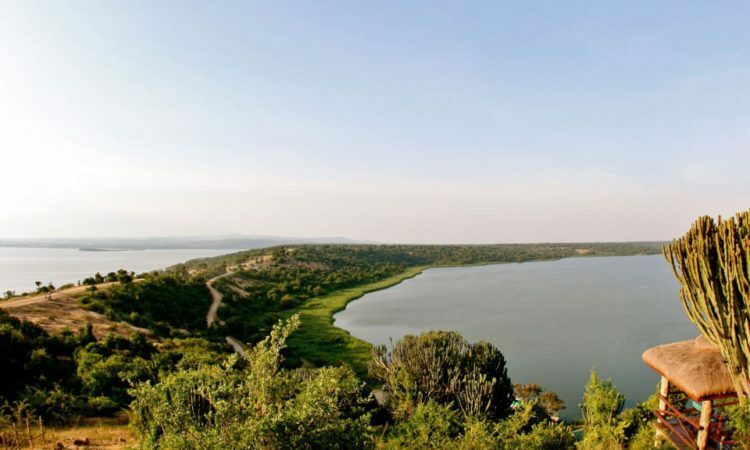 The park also contains the two crater fields including the Bunyaruguru crater field and the Katwe crater field with series of impressive scenic lakes some of which are salty such as Lake Katwe. 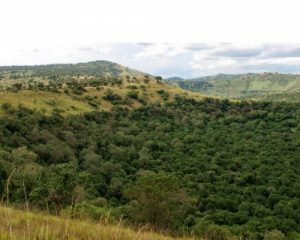 Queen Elizabeth National Park shares districts of Kasese, Bushenyi, Kamwenge and Rukungiri and is 417km about 7 hours west of Kampala, Uganda’s capital city. It is close to Kasese town in the north and Bushenyi town in the south. The park was changed to Queen Elizabeth National Park in 1954 in commemoration of the Queen of England’s visit. Queen Elizabeth National Park has great biodiversity ranking in relation to other world parks. The Park has got 10 species of primate, 95a species of mammals, and four of the big five land animals and 20 predator species. Queen Elizabeth National Park’s wildlife species include; lions some of which climb trees, spotted hyena, side stripped jackal, leopard, water buck, Uganda kob, bush buck, topi, and elephants, hippos, Buffaloes, warthogs, chimpanzees, olive baboons, red-tailed monkeys, blue monkey, black and white colobus monkey and Nile crocodiles. The national park of Queen Elizabeth has 600 bird species which makes the number one in Uganda, the second in Africa and the sixth in world. The varied ecosystem environments of Queen Elizabeth National Park pose the ground for existence of a range of birds. These areas include; Kasenyi Area. 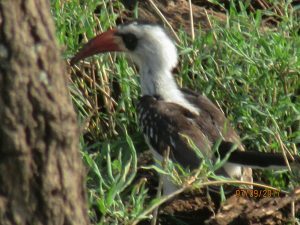 The open plains of Kasenyi offer ideal birding opportunities for borders on Uganda safaris. Birds that can be encountered include; Ruppell’s Griffon Vulture, Palm-nut Vulture, African White-backed Vulture, Hooded Vulture, Lappet-faced Vulture, Wahlberg’s Eagle, Bateleur, Brown Snake Eagle, Long-created Eagle, Martial Eagle, African Crake, Grey Kestrel, Black-bellied Bustard, Crowned Plover, Temminck’s Courser, Senegal Plover, Rufous napped Lark, African Wattled Plover. Kittlitz’s Plover, White-tailed Lark, Flappet Lark, Brown-backed Srub-Robin, Croaking Cisticola, Zitting Cisticola, Black-lored Babbler, Grey-capped Warbler, Black-crowned Tchagra, Grey backed Fiscal,Pin-tailed Whydah, Black-headed Gonolek and Fork-tailed Drongo. The Mweya Peninsula. 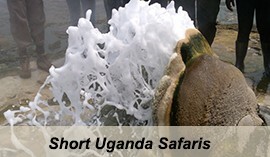 The Mweya peninsula is as trip of land that is engulfed by Lake Edward and Kazinga Channel. The bird species in this area include; Diederik Cuckoo, African Mourning Dove, Raptors, Swamp Flycatcher, Slender-tailed Nightjar, Squire-tailed Nightjar, Grey-Headed Kingfisher, Swamp Nightjar, Blue-naped Mousebird, Red-chested Sunbird, Pygmy Kingfisher, Nubian Woodpecker, Little Bee-eater, Swallows, Martins, Red-capped Lark, Swifts, Grey-capped Warbler, Black-headed Gonolek, Lesser Masked Weaver, Scarlet-chested Sunbird, Pin-tailed Whydah, Slender-billed Weaver and Yellow-backed Weaver. Maramagambo Forest. The mature tropical rainforest of maramagambo has got a range of birds among which include the following; Blue-breasted Kingfisher African Finfoot, Red-chested Cuckoo, Little Grebe, African Emerald Cuckoo, Yellow bill, Black Cuckoo, Black Coucal, Barbets, Black Bee-eater, Blue-throated Roller, Red-shouldered Cuckoo-shrike, Red-throated Wryneck, Honey guide Greenbul, Blue-shouldered Robin-Chat, Brown-eared Woodpecker, Dark-capped Warbler, African Moustached Warbler, Green Crombec, Broad-tailed Warbler, Croaking Cisticola, Black-and-white Shrike Flycatcher, Black-headed Batis, Chestnut Wattle-eye, African Paradise Flycatcher, Marsh Tchagra, Brown Illadopsis, Brubru, Black Bishop, Western Black-headed Oriole, White-breasted Negrofinch and Sulphur-breasted Bush-shrike. Katwe Area. The series of crater lakes and crater hollows present a rich ground for existence of various bird species including; lesser and greater Flamingoes on Lake Munyanyange. Other bird species in the area include; Eurasian Mash Harrier, Montagu’s Harrier, Pallid Harrier, Avocet, Little Stint, Curlew Sandpiper, Common Greenshank, Gull-billed Tern, Red-capped Lark, African Moustached Warbler, Lesser Black-backed Gull, Broad-tailed Warbler, Southern Red Bishop and Croaking Cisticola. Ishasha Sector. The southern sector of Queen Elizabeth National Park (Ishasha) is not only a habitat for tree climbing lions but also counts of birds including; Shoebill, Palm-nut Vulture, Hooded Vulture, White-backed Vulture, African Ruppell’s Griffon Vulture, Lappet-faced Vulture, Brown Snake Eagle, Wahlberg’s Eagle, Bateleur, Long-created Eagle, Grey Kestrel, Martial Eagle, African Crowned Eagle, Black-bellied Bustard, Helmeted Guineafowl, African Crake, African Green Pigeon, African Wattled Plover, Ross’s Turaco, Senegal Plover, Broad-billed Roller, Double-toothed Barbet, Striped Kingfisher, Greater Honeyguide, White-headed Barbet, Brown-backed Scrub-Robin, Grey Woodpecker, White-browed Robin-Chat, Cisticolas, Yellow-billed Oxpecker, Grey-backed Fiscal and Green Crombec. Lake Kikorongo. This is very close Lake George along the Kasese – Katunguru road and is knonwn for arrange of birds including waders, Common Squacco Heron, Saddle-billed Stork, Shoebill, Sacred Ibis, African Jacana, Black Crake, Knob-billed Duck, Lesser Swamp Warbler, Yellow Wagtail, White-winged Warbler, Papyrus Gonolek, Carruther’s Cisticola and Greater Swamp Warbler. Katunguru Bridge Area. 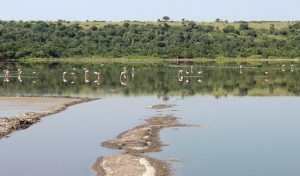 Kazinga bridge are shelters a range of birds including; White-winged Tern, Pink-backed Pelican, Gull-billed Tern, Lesser Swamp Warbler, Pied Kingfisher, Malachite Kingfisher, Carruther’s Cisticola, Greater Swamp Warbler, Papyrus Gonolek and White-winged Warbler. Kazinga channel is one of the main features of Queen Elizabeth National Park that always attract travelers to undertake safaris in Uganda. The 45m long Kazinga channel interlinks Lake George in the east and Lake Edward in the west. Lake George is approximately 2.4m deep and 259km2 in width and is watered by the glaciers that sparkle down from the snowcapped mountains of the moon – the Rwenzoris. Kazinga Channel is the lakes outflow and drains into Lake Edward which is a bit bigger about 2,000km2 and is considered be among the major fresh water lakes in Uganda. The Kazinga Channel supports populations of wildlife including the Nile crocodiles which is the second largest reptile in the whole world, hippos and over 60 bird species and counts of wildlife that dwells on its channel shores. 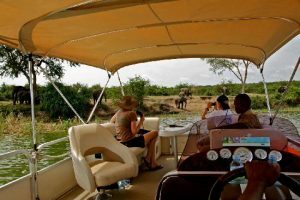 While on your wildlife safari in Queen Elizabeth National Park, a launch cruise on the Kazinga Channel is important for the reason that the channel has a picture-perfect place for the parks’ key wildlife. The cruise is strictly 2hours; and below is the fixed control time. The time for boats can be adjusted depending on the tourist’s demand. Queen Elizabeth National Park is luckily crossed by the world’s main latitude – the Equator. 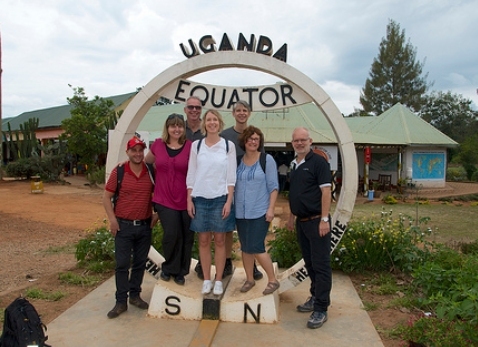 It has the equator crossing site is close to the crater gate along Kasese – Katunguru road. The equator divides the world into the northern and southern hemispheres respectively. 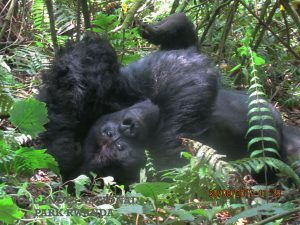 This site offers unique encounters for photography thus worthy encountering while on Uganda safaris. In 1954 Queen Elizabeth gave a provision shelter for this site until in 1959 when a permanent pavilion was constructed for the visit of Queen Elizabeth. Renovations were made by second visit of Duke of Edinburgh in 2007 with better facilities such as coffee shop and internet facilities. 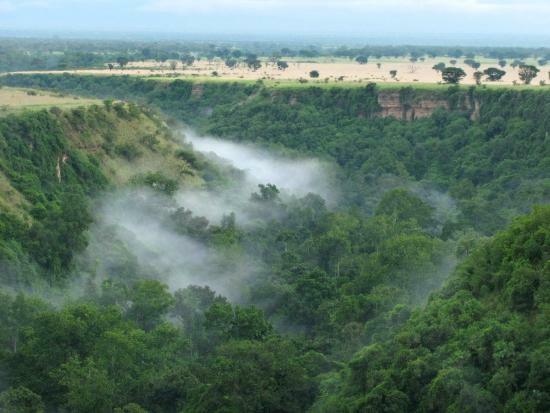 The 100m deep Kyambura gorge is positioned in the east of Queen Elizabeth National Park and is 1km wide. The gorge has got great scenic beauty and besides that it has populations of common chimpanzees that flourish in a mature tropical forest one of its king to thrive below sea level. The gorge floor is traversed by Kyambura River that makes an encounter of the area amazing while on Uganda safari. Mweya Peninsula positioned on the northern shore line of the remarkable Kazinga channel where it fixes with Lake Edward. By road, the Mweya Peninsula is 55 kilometers southwest of Kasese district and nearly 400 kilometers from Kampala, Uganda’s capital city. 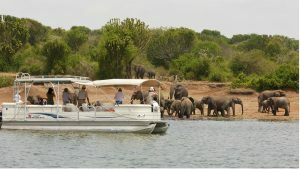 Majority visitors that safari the Mweya Peninsula enjoy the 2hours launch cruise on the Kazinga channel. The cruise enables you view the water and the Rwenzori mountains. Mweya likewise is the premium place a person can spot leopards in the scrubby thickets. The birding encounter in Queen Elizabeth National Park is one of the thrilling activities that you can ever undertake while on safari in Uganda. The park has 600 species of birds which makes it the forest in Uganda, the second in Africa and the sixth in the whole world. The varied environments of Queen Elizabeth National Park pose a rich ground for birds and birding in particular. These include; the forests of Maramagambo, the Savannah plains of Kasenyi, Ishasha and Mweya peninsular, the water environments of Lake Kikongoro, Katunguru Bridge Area and Katwe. Bird species that can be seen include among others; Grey Kestrel, Martial Eagle, Papyrus canary, African broad bill, Pink-backed pelican, lesser and greater Flamingoes, Black- rumped Buttonquail, Martial Eagle, Black-bellied Bustard, Helmeted Guineafowl, African Crake, African Green Pigeon and African Wattled Plover among others. 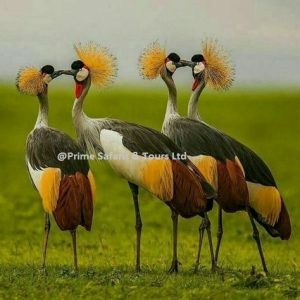 The birding encounter in Queen Elizabeth National Park is best done from December to February and a stay of 2 – 3 days is adequate to enable you explore the park’s birding environs. 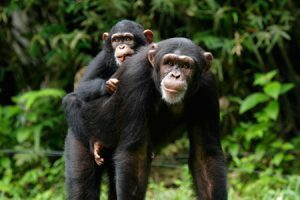 There are populations of Chimpanzees in the Kyambura gorge which are habituated and are set for chimpanzee trekking encounter. The chimpanzee trekking in Kyambura is considered challenging due to the nature of the terrain involved. The sloping down and hiking up the gorge is a bit strenuous and makes the encounter with chimpanzees more rewarding. The activity commences in the morning at 8am and in the afternoon at 2pm. 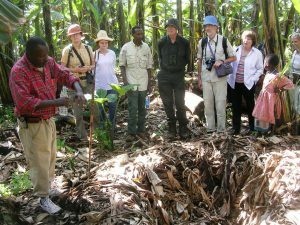 The Kyambura Gorge experience is more than discovering chimpanzees in their natural environment: it teaches visitors about the ecosystems of Kyambura Gorge’s atmospheric “underground” rainforest, including vegetation types; bird identification and behavior; and chimp and monkey ecology. 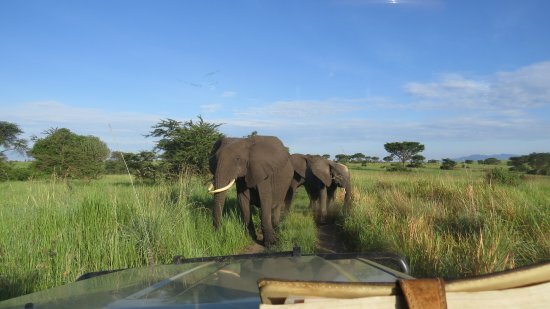 The amazing wildlife of Queen Elizabeth National Park can be explored by taking a game drive. 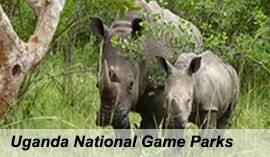 The game drive activity is carried out along the stretches of Kasenyi where counts of wild game including lion, elephants, buffaloes, Kobs among others are encountered. 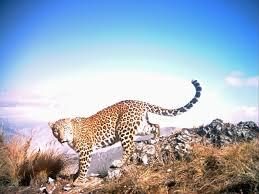 The channel tracks give possibilities of encountering leopard along with other species. 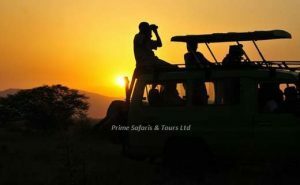 The game drive activity is best done in the morning at 6:30am and in the evening at 4:00pm and it tends to last 3 – 4 hours. 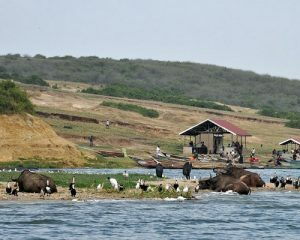 Kazinga Channel which is 45km long offers impressive launch cruise to Uganda safari under takers. The thrilling launch encounter commences from Mweya jetty and explores the channel towards the Katunguru bridge area and then back to Lake Edward (Uganda – Congo boarder). It is best done in the afternoon when the animals are gathering on the channel shores for drinking. 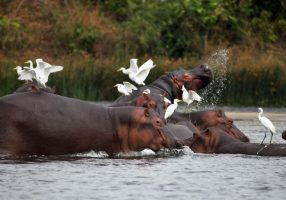 The aquatic animals like Hippos and Nile crocodiles make it a thrilling encounter. The launch cruise lasts for two (2) hours. The UWA launch departs at 3pm and 5pm while the private launch departs at 2pm and 4pm daily. The Kikorongo Women Community offers impressive encounter of the traditional life in Kikorongo village. It involves interesting music dance and drama, fire making and craft making. The leopard village nears the Muhokya village in the north of Queen Elizabeth National Park. This village exposes you to the traditions of the locals including the traditional huts of the Basongora, Bakonzo, and Banyabindi along with their handicrafts and performances. 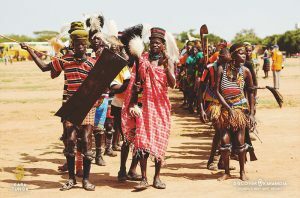 Visitors can tour replicas of the traditional huts of the Banyabindi, Bakonzo, and Basongora ethnic groups, watch traditional song and dance performances, and purchase handicrafts made by local communities. Longer visits can include conversations with community members about the challenges and opportunities they face living next to the park, visits to local schools, and discussions about traditional village life and solutions for human-wildlife conflict. We can work with tour groups to create a customized program. The Katwe Tourism Information Center (KATIC) takes you through the offerings at Lake Katwe salt lake exploring the process of salt making, extraction and eventual production and how the people have molded their livelihood around tis natural product. They also have interesting traditional performances and handicrafts. Katwe Salt Lake Tour gives a unique insight into the fascinating yet tough process of salt mining, as well as providing an alternative income for Katwe. See villagers at work on the lake, cross the mud walkways and enter a traditional grass hut. You will also pass the nearby bird sanctuary lake, home to thousands of birds, including flamingoes from October to May. A bird watching boardwalk will be ready in 2012. The Kichwamba Escarpment is the eastern side of Queen Elizabeth National Park. The Agro-tour walk commences from the Katara village lasting 2 – 3 hours involving hiking through farmlands in the cool morning or in the evenings. There is also provision for honey harvesting. Visitors will also learn about the enduring challenge of human-animal conflicts in the area, and will tour the beehives that are used to divert destructive elephants away from community crops on the park border. Interested clients will even have the chance to try their hand at honey harvesting. After enjoying the peace of the endless savannah and the shade of the trees, visitors hike back up the escarpment and can return to their lodges. This community encounter exposes you the scenic views of the volcanic craters that are surrounded by rewarding tunes of cranes and eagles. The encounter allows you to take a canoe ride on the lake with pure waters amidst sights of primates and birds. The community takes you to their cultural museum and the Banyaruguru hut where various traditional artifacts are gathered. This community run establishment also offers three, fully furnished private bandas and a campsite. All visitors are invited to use our restaurant and bar, and enjoy our evening traditional dance performances. 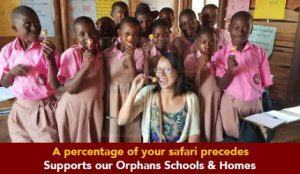 A generous portion of your activity and accommodation fees go directly to community development, conservation and educational projects. Mweya Peninsula also offers impressive nature walks for viewing the good sceneries of Kazinga Channel, Lake Edward and rolling savannah landscapes. The Jacana Safari Lodge is situated on the eastern boarder of Queen Elizabeth National Park overlooking Lake Nyamusingire. The lodge has ten spacious, luxury chalets and a family cottage with two interconnecting rooms. Rooms are well versed with en-suite washrooms even with warm showers and with a terrace to allow scenic views of the adjacent lake. 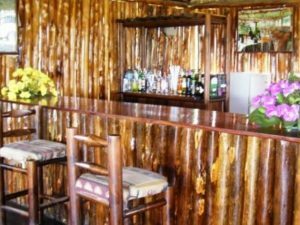 It also contain a restaurant and bar, Virunga lounge which features a fire place, sofas and hammocks, sundowner bar with the views of the lake, swimming pool, and sauna and massage area, self-contained chalets and a family cottage, floating captain’s table pontoon for a dinner on the lake. 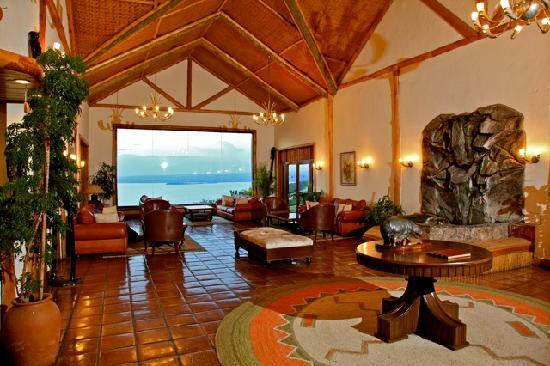 Surrounded by the National Park and bordering the Kazinga channel, the lodge has a truly unique setting. 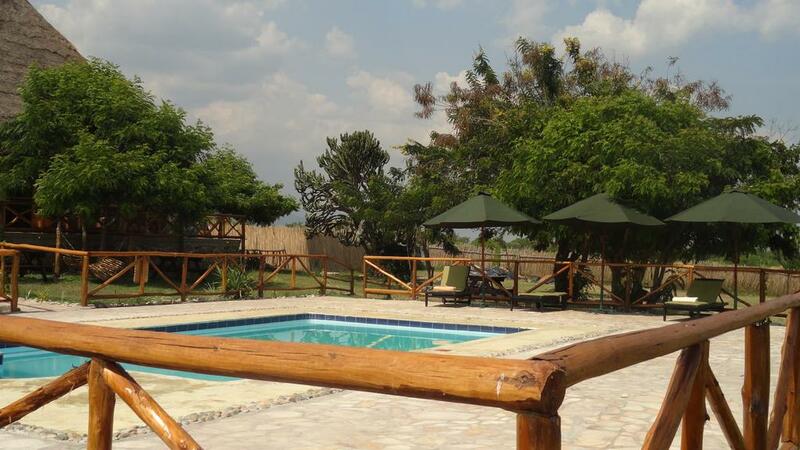 Bush lodge currently consists of 6 self-contained units which are spaciously placed. The rooms are made from a fine combination of canvas and local materials. The rooms are self-contained with private en- suite bathroom with an eco-toilet and an outside shower where 2 showerheads allow couples to take their shower together. The lodge also offers lazy camping services at a budget friendly option in the form of non-self-contained tents. This lazy camping consists of a basic camping tent furnished with 2 single beds and a solar lantern. 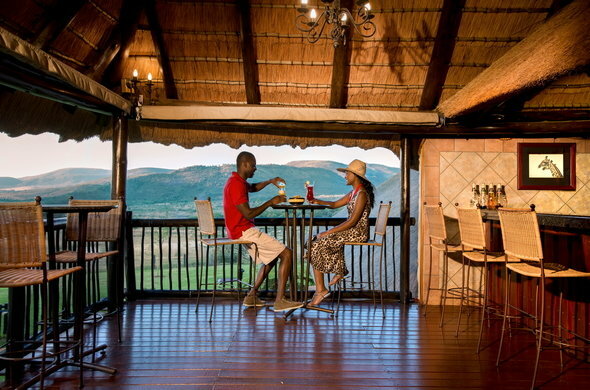 Restaurant and bar from the main lodge are open to our guests on lazy camping. The lodge also has a camp site open to camping travelers. Internet access in common areas. 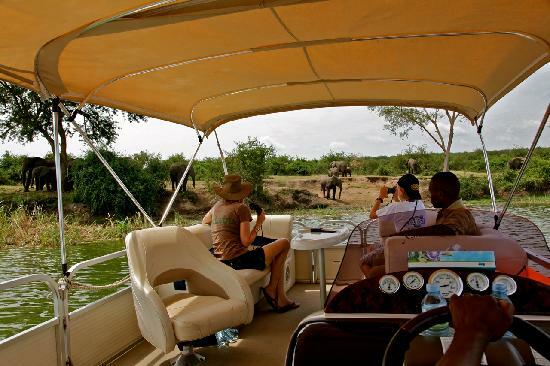 Established in September 2006, Hippo Hill Camp is the only luxury tented Camp in Queen Elizabeth National Park. The Camp is a must see place! It is spectacularly well-built on a hill overlooking Kitako and Kabazimu Islands. It is also surrounded by Lake Edward, the Katwe salt Lake and Munyanyange crater Lakes that contain lots of flamingoes, Hippos, buffalo and other other animals. The Camp presently offers 10 luxury tents with private toilets and hot showers. 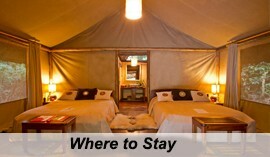 These tents are walk-in safari tents with their own en-suite facilities including cold and hot water. All tents are very well furnished to ensure comfort for all. 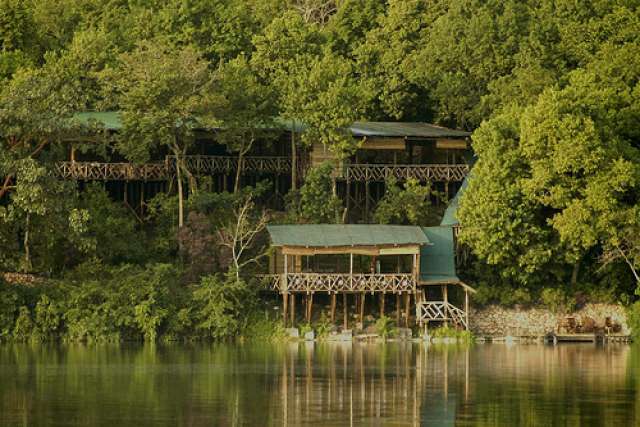 The Ishasha Wilderness Camp is positioned in the southern sector of Queen Elizabeth National Park. 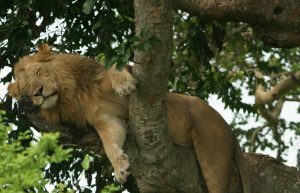 The Ishasha sector is re-known for tree climbing lions thus Ishasha wilderness camp can be a perfect ground to explore these species. Its accommodation is offered in ten (10) upmarket self-contained safari tents featuring bush showers and flushing eco-friendly toilets. The Camp has main lounge and dining area with thatched cover, central charging facilities for 240V, 3 Pin UK style plugs and internet connectivity. 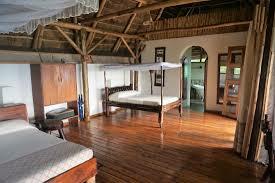 Mweya hostel is adjacent to the luxurious Mweya Safari Lodge. 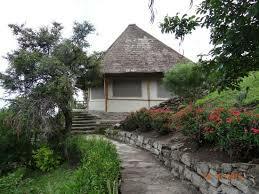 The Mweya institute of Ecology known as Mweya Hostel is a budget facility in Queen Elizabeth National Park. It offers overnight stay to Uganda safari travelers with single and double rooms, shared bathrooms and toilet facilities. Some rooms are self-contained while others can accommodate about 4-6 people. Kitchen, Living room is available. The hostel has a restaurant where meals are served and a canteen where few purchases can be made. Mweya Safari Lodge is positioned at the center of Queen Elizabeth National Park in a peninsular that is surrounded by Kazinga channel and Lake Edward. 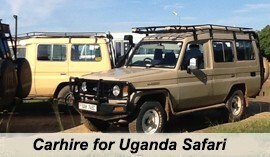 It is a top notch luxury establishment worthy of spending an overnight at while on Uganda safaris. The lodge has 32 standard rooms, 12 deluxe rooms, 2 suites along with the presidential and queen cottages, 2 family cottages, 2 luxury tents and 2 standard tents. Mweya Safari Lodge has swimming facilities, restaurant, business center, gift shop, conference facilities, bar and an information center. 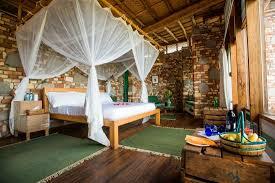 Simba Safari Camp is a budget safari accommodation situated on the border of Queen Elizabeth National Park. Here you will find a variety of comfortable and affordable guest rooms, dormitory rooms and a well-established camp site. Located on a hill, the camp offers spectacular views of Lake George, Lake Kikorongo and the savannah plains stretching till the far horizon. It is the closest accommodation for game drives in the Kasenyi plains, while elephants and buffaloes can often be viewed from the camp. En- suite rooms. It has nine double/twin rooms and two triple rooms. The rooms are spacious and well furnished with two single beds or a double bed and mosquito nets. En- suite is a bathroom with running water and flushing toilet. Family Cottage. This is suitable for family stay. It consists of two bedrooms, a fully equipped bathroom and a living room with an extra bed. 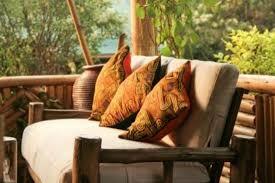 Also a spacious veranda is available to sit comfortably with your family. The individual cottages take a maximum of 5 people. Kyambura Lodge is situated at the eastern edge of Queen Elizabeth National Park, in the western part of the great East African Rift valley, with fantastic views over the national park and the Rwenzori Mountains and at a short distance from the Kyambura Gorge. The lodge has been built using environmentally friendly local materials fitted by a local community workmanship. Accommodation is provided in seven spacious and tastefully designed self-contained grass-thatched cottages, with bath tabs/showers with views to the park, running hot and cold water, equipped with 220v electricity and a private wooden balcony overlooking the park. We have a swimming pool, adjacent to the campfire where a local traditional dance is often performed (Banyaruguru troupe). It is located outside the park on strategic Kichwamba escarpment. It has about 250 meters over the plains that give a magnificent view of the park, Mountain Rwenzori along with the Kazinga channel. The accommodation rages from 2 family units, 3 double rooms, 2 triple rooms and 1 en suit. The lodge has the capacity to accommodate 36 visitors. 8 unique timber or brick guest bandas with iron sheet or thatch roofs (3 doubles and 5 twins) reflect the local building style. Rooms have mosquito nets, 240v lighting and a private balcony. 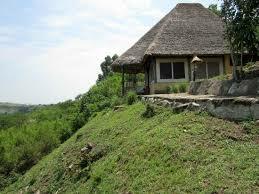 The Enganzi Game Lodge is located on a hill bordering the Queen Elizabeth National Park. With 5 splendidly set cottages which offer a picture-perfect view of the Queen Elizabeth National Parks. 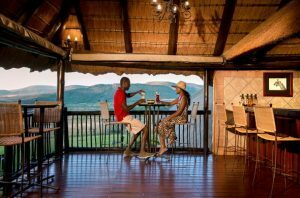 Enjoy sundowners or a 3-course dinner in the dining room or upper deck enjoying the beauty that Africa has to offer. Enganzi lodge has both single and double rooms with a good restaurant and bar. 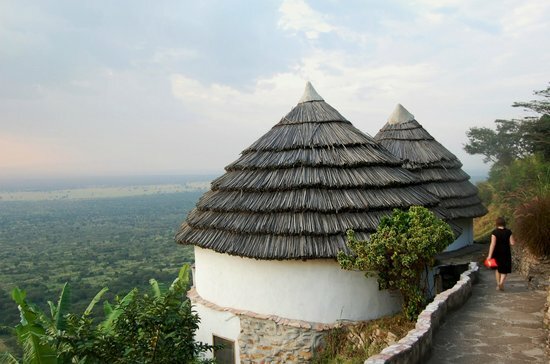 It is situated on the Great Rift Valley escarpment with uninterrupted views of the savannah, Lake Edward and the Virunga and Rwenzori mountain ranges beyond, Katara Lodge is a 20-minute drive away from the main entrance of the Queen Elizabeth National Park. The lodge offers accommodation in seven luxurious thatched cottages with each spacious cottage made of locally available materials and carved into the hillside by the Katara village community. 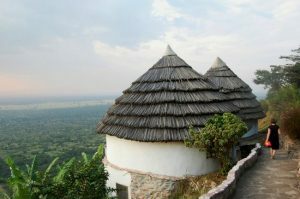 The cottages combine wooden floors, grass thatched roofs and canvas that can be folded away for uninterrupted views of the park stretching out below. Our water is heated using solar thermal energy and swimming pool is available. 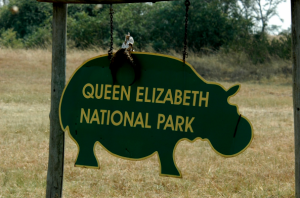 Queen Elizabeth National Park can be connected to from the following points also be accessed on public means. Buses connect daily from Kampala to Kasese. There are other public means to Katwe and Katunguru trading centers which are very close to the park. From these centers, you can get a private vehicle to connect to your lodge. Queen Elizabeth National Park can also be connected to by Air travel. Aero link operates scheduled flights from Entebbe International Airport to Kasese and Mweya Airstrips. Other charter carriers offer the same service from either Entebbe Airport or Kajjansi Airfield to Kasese or Mweya Airstrips. From Entebbe International Park, the fastest route includes a ferry for 1.4km after an 8km drive from Entebbe then a road drive again to the Park. The total distance is 381km a road drive of about 7h 3min. The other route is Entebbe via Mbarara-Kasese road which is 415km taking about 7h 18min. From Kampala, the fastest route is Kampala-Fort Portal road 372km about 6h 26min to south western Uganda. From Kasese town, via Fort Portal-Mpondwe road Queen Elizabeth National Park is 30km about 8minutes drive. From the nearest town of Kasese, Queen Elizabeth National Park is 45.3km about 47minutes drive via Hima- Katunguru road. From Kibale Forest National Park, Queen Elizabeth National Park is 98.9km via Fort portal-Mpondwe road. From Bwindi Impenetrable National Park, Ntungamo-Katunguru road is 300km taking about 5h 57min. From Rwenzori Mountains National Park, Fort-portal-Mpondwe road is 35.4km about 63min. By Air; A chartered flight for a wildlife tour in Uganda can be organized from Kampala at Kajjansi which takes about 2h 15 minutes in about 290km. From Kasese airstrip, Queen Elizabeth National Park is 5.1km via Fort portal-Mpondwe road taking about 13minutes. Lake Katwe, 10 species of primate, 95 species of mammals, four of the big five land animals, 20 predator species, Birds, Cimp tracking, Game Drives, Nature walks etc.